Welcome to the web presentation of the Prague Restaurant U Betlémské kaple. The restaurant is located in the midst of the historical streets of Central Prague. Let us invite you in this stylishly designed restaurant with highly attractive environment that offers romantic atmosphere. 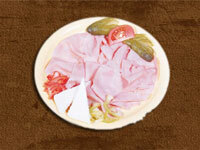 Try our quality tasteful menu, traditional Czech cuisine and some extras. The visit of this restaurant will be great experience for you. We prepared a new web presentation for you. You can find here detailed information about our Restaurant U Betlémské kaple as well as the menu, drink menu and specialties. We also prepared special offers of individual menus for travel agencies and travel offices. Besides that, we are able to arrange for other events according to their requests.